This beautifully made, high quality garden skittles set is a relaxing and fun way to pass the time outside. Skittles is a simple game to play, just knock as many skittles down as you can! 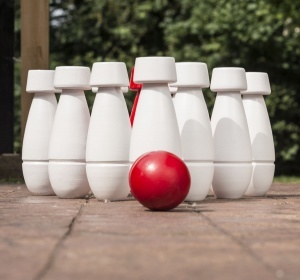 Each of these solid wood skittles stands at 21cm tall and is painted in a high quality finish. 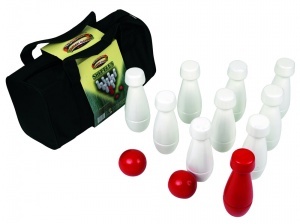 The set includes 10 garden skittles and two wooden bowling balls, all of which can be stored in the canvas holdall. Please note that this game is designed for older children and adults. Younger children can play but adult supervision is recommended. 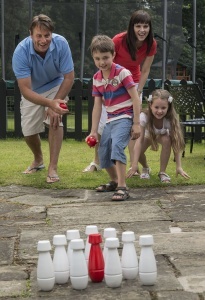 The perfect garden game for fetes, fun days and other outdoor events. This wooden garden skittle set is suitable for indoor and outdoor use. Wholesale and bulk buy discounts may be available on these skittles subject to required quantity. Please call us to enquire.